Stocks are just shy of all-time highs as the sideways trade continues. Today was the last day of the quarter and volume was well under average yet again. 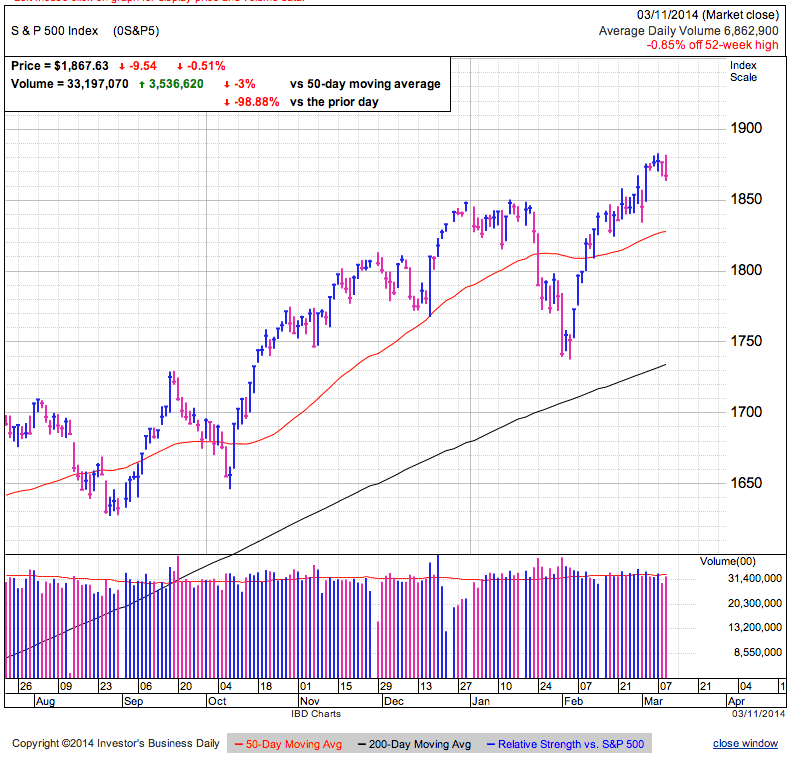 The market has largely traded between 1,840 and 1,885 since mid-February and Monday’s strength pushes us back into the upper half of that range. Owners don’t want to sell and those with cash don’t want to buy. This standoff leaves us trading sideways on low volume. Holding these levels for several weeks gives the edge to bulls since markets tend to roll over from unsustainable levels fairly quickly. Bears keep predicting an imminent sell off and while we might be approaching one, we need a material catalyst to kick it off, something that has so far been MIA. To this point owners have ignored any and all bad news as they continue holding stocks and that reluctance to sell keeps supply tight, allowing this market to maintain current levels even on low demand. While many shorts were chased out of the market in February’s rebound, this sideways trade seduced many of them back in. They shorted every dip to 1,840, but since many have stop-losses above recent highs near 1,885, that means many of these shorts have not been shaken out by recent volatility. While those in cash might be reluctant to buy stock, shorts with automatic stop-losses above 1,885 will fuel a short squeeze and provide the lift needed to push us to new highs. Whether this breakout is ultimately sustainable is in the hands of those sitting on cash. Will they buy the breakout, or will they patiently wait for more attractive prices? It seems like many of those that believe in this market are already in, leaving fewer left to chase a breakout higher. Larger selloffs in recent years occurred in the low-volume summer months and sitting near all-time highs leaves us vulnerable to the inevitable bout of periodic selling. The market is poised to hit all-time highs in coming days, but demand will likely dry up following the primarily short-squeeze driven gains. 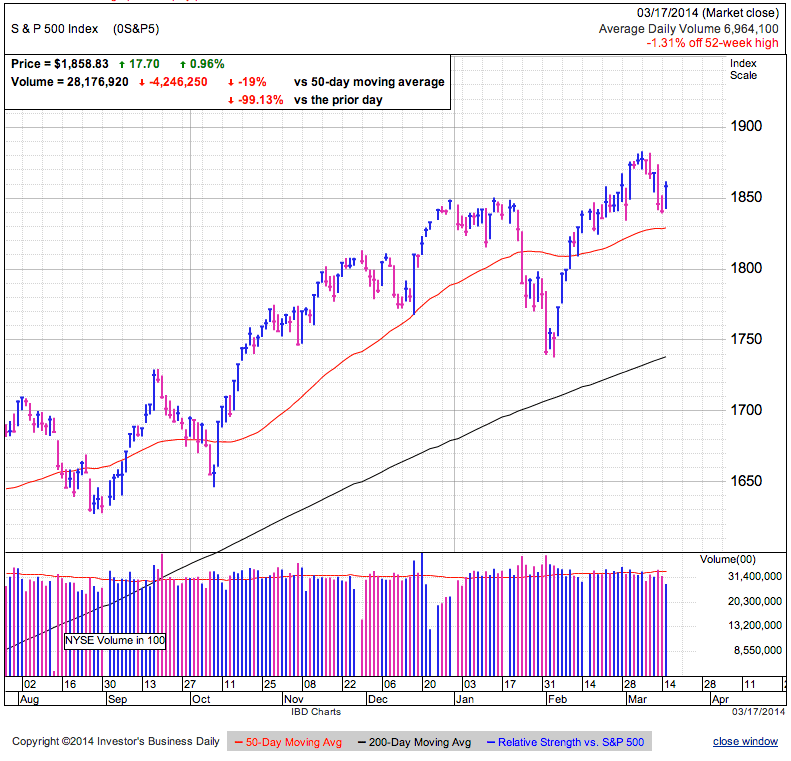 The market is only up a handful of points since the start of the year and this sideways consolidation could be setting the stage for the next round of bull market gains. As always, it comes down to timeframe. Long-term investors can and should ignore these near-term fluctuations. The one exception is deciding when to add new positions. We are near all-time highs and patient, long-term investors will likely see better prices at some point over the next six-months. There is no reason for these long-term investors to try to time the market with their existing positions, but they can hold off on making new purchases. Intermediate investors can consider proactively locking in profits in anticipation of a pullback into the 1,750/1,850 trading range, or at the very least employ a trailing stop to protect recent profits. More nimble traders can wait for the short-squeeze to all-time highs and short the market if it stalls shortly after. 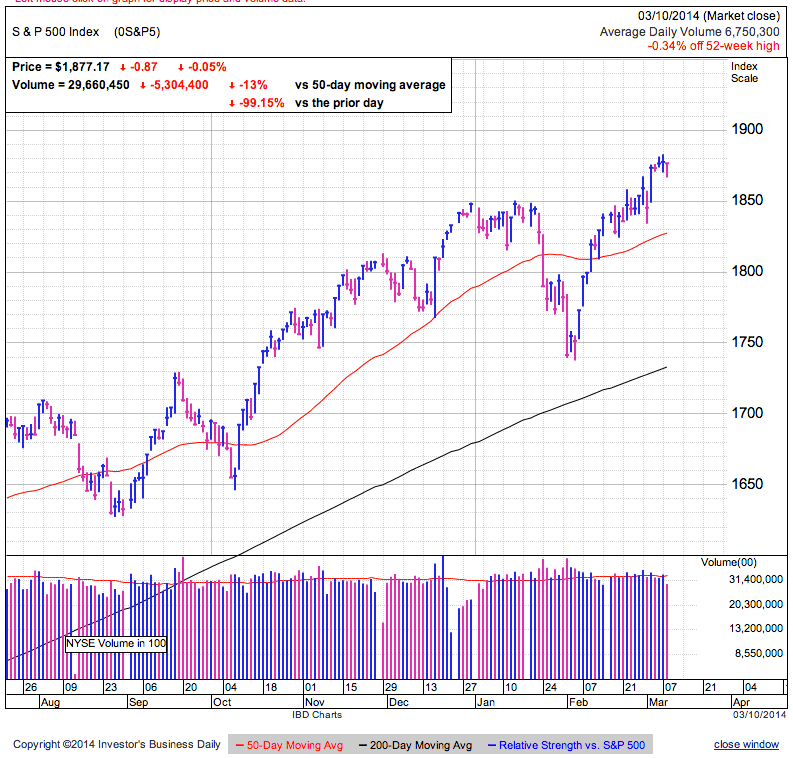 Stocks retreated from early gains and finished just above 1,850 support as they continue bouncing around between 1,850 and 1,880. Volatility is increasing as intraday ranges span more than one percent, but the market is not moving higher or lower as each gain or loss is quickly unwound the next day. Owners don’t want to sell and those with cash don’t want to buy. This standoff leaves us trading sideways as both demand and supply remain balanced. Volume has been light, probably due to big money managers taking their kids skiing for spring break. The big questions is what will happen when they come back to work. Will they start locking in profits or bidding up the price of stocks? Complacency is the rule as geopolitical conflict between Western Europe and the world’s largest oil producer largely goes unnoticed. The best profit opportunities arise when the market overreacts to some fear mongering and owners give away their stock at steep discounts. Those reduced prices compensate dip buyers for taking the risk, but near record highs there is little reason to own the risk since no one is willing to pay us for it. While momentum is still higher, making money in the markets comes from balancing risk and reward. 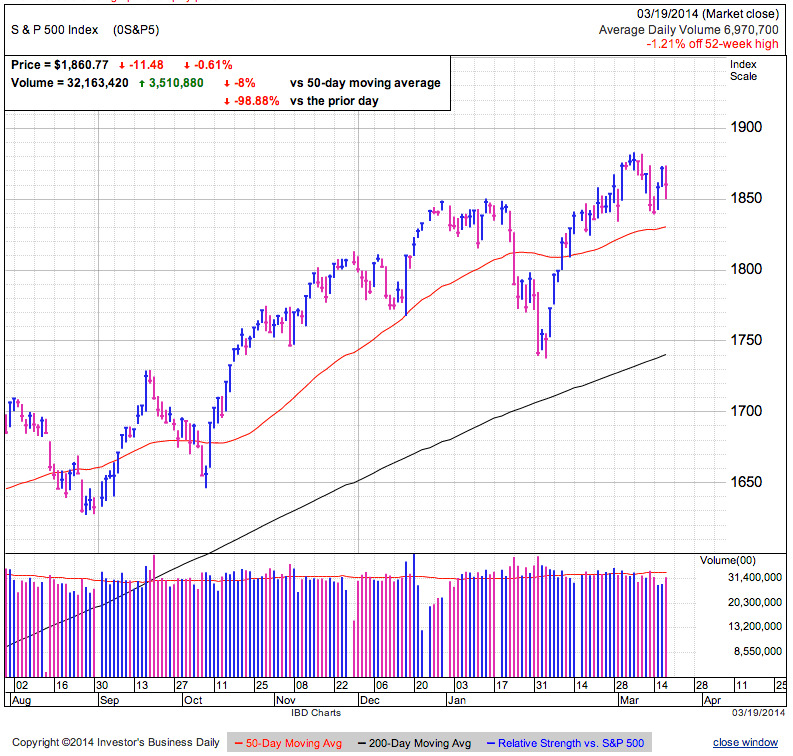 Stocks have either stalled above 1,850 and are on the verge of reversing, or they are resting before making their next move higher. And to be honest, I could easily see either outcome happening. Sometimes we don’t have an edge on the market and it is best to wait for the next trade with better odds. Everyone can make money in the markets, the hard part is keeping it. The number one way people give back profits is forcing trades when there isn’t one. It was a quiet day up until Janet Yellen rattled the markets with her first press conference. 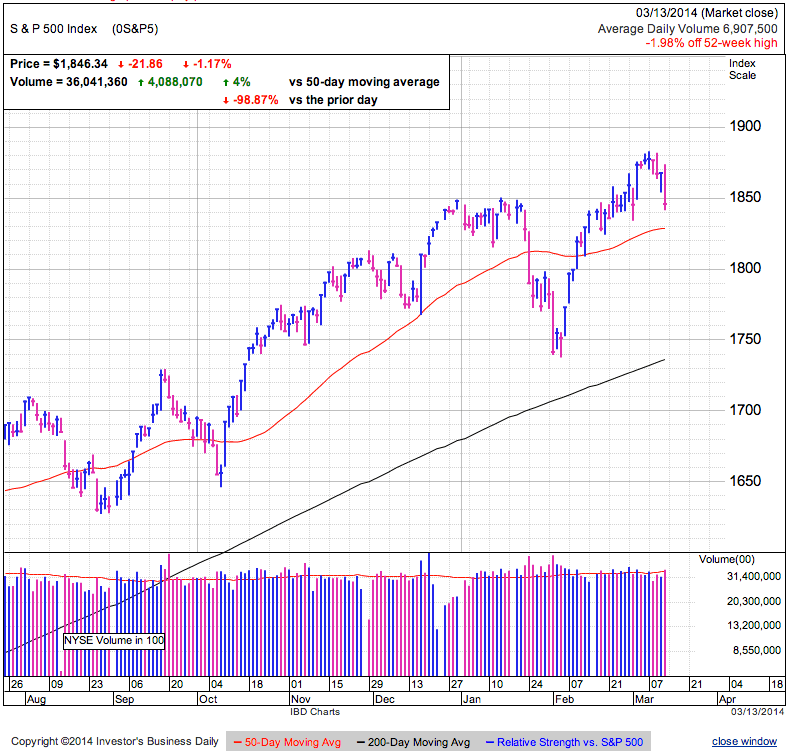 Stocks plunged dramatically to 1,850, but found support at this key level and bounced off the lows by the close. The intraday range stretched nearly 25-points, but the market finished down just 11.5 points. Yellen was supposed to be more dovish than Bernanke, but her revelation that interest rates could be raised within six-months of the end of QE was faster than many expected. This means we could see short-term interest rates increased as soon as a year from now. But most likely the market overreacted to this news. Number one, the Fed would only make this move if the economy is improving enough to withstand higher rates. And two, going from zero percent to one percent still counts as stupid low rates by historic standards. This is nowhere near the four and five percent rates that are used to throw cold water on overheated economies. As traders we should embrace market overreactions because that is what profit opportunities are made of. If stocks were always priced appropriately, then we couldn’t make money except through dumb luck. The question now becomes if the overreaction will be to the upside or the downside. 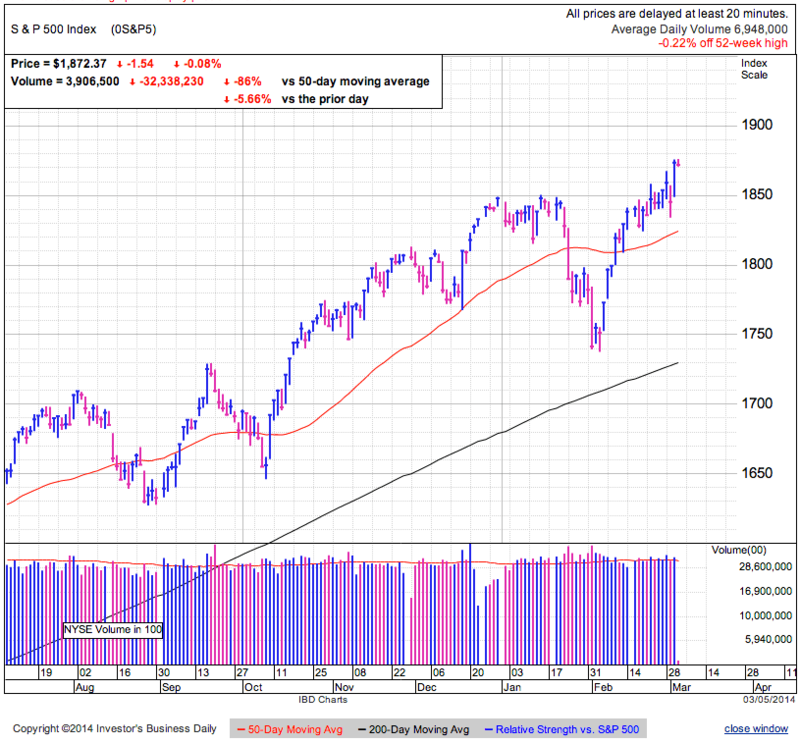 Will the market continue ignoring risk as it pushes to new highs? Or will traders develop an irrational fear of Yellen and run for cover every time she steps near a microphone? Given how quickly traders brushed off conflict with the world’s largest oil producer, I don’t expect the market to panic over Yellen’s comments either. But rather than think for the market, we will let it decide for itself. If the selloff builds momentum, we could see another Taper Tantrum like selloff. If we hold these levels tomorrow, then the Fed meeting is already old news. When the market gets upset, it is painfully obvious and it won’t take long to tell what the market is thinking. If the market holds these levels tomorrow, we’ll probably drift up to 1,900 before demand becomes an issue. Crash through 1,850 and previously confident owners might not remain so confident. Be careful with long positions here since the upside is far more limited than the downside. Stocks added to yesterday’s gains and recovered most of last week’s modest Crimea selloff. 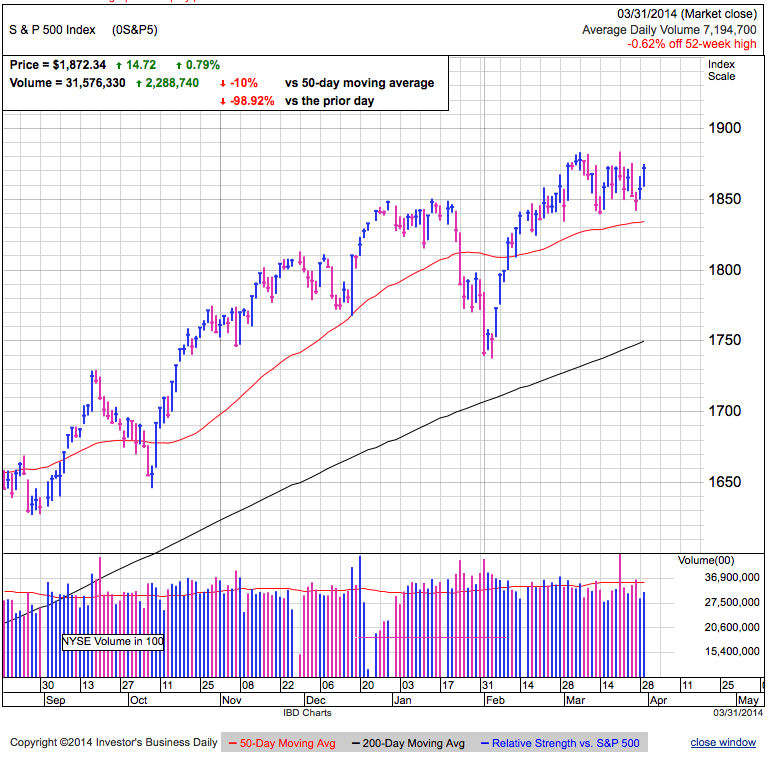 Volume was light for a second day as many buyers take a wait-and-see attitude toward this rebound. Owners remain confident while everyone else stays cautious. Last week’s selloff came on unusually restrained volume given the volatility and headline risk. This week’s rebound continues the suspiciously light volume. What this tells us is most owners are perfectly content holding on to what they have regardless of the price action or headlines. This is a dramatic shift in sentiment from 2013 where the market was constantly spooked by an endless stream of bearish headlines. Last year many were afraid to own stocks, this year they are afraid to sell them. While many will claim complacency is a sign we are at a top, by itself complacency is bullish. When no one wants to sell, supply becomes tight, making it easy for markets to rally on low volume. Complacency doesn’t kill bull markets, lack of new buyers does. Rather than focus on owner’s confidence, we need to look at who is buying record highs. Last year’s bond market selloff flushed many long time bond owners out of that market and their shift to equities propped up stocks. But we’ve seen a rally in bonds in recent months, taking pressure off bond owners. This means there are fewer bond sellers and less money to reallocate to equities. Other investors fled volatility and uncertainty overseas, causing them to seek the safety and security of US equity markets, but those that are still in foreign markets are probably in it for the long haul and we should expect the flow of international investment in our markets to slow. While it doesn’t take much demand to prop up prices when confident owners keep supply tight, we need to see new money continue flowing into our markets to extend this bull market. Stocks are rebounding on light volume, showing low participation on the buy-side. We can continue heading higher as long as owners stubbornly hold on to their positions, but waning demand threatens to let us slip back into the 1,750-1,850 trading range. Nothing gets people excited about stocks like rising prices. Those left out of the rebound from the 2009 lows are starting to warm up to stocks again as they hear about all the money their neighbors and coworkers are making in the market. While this can keep pushing us higher for months, these buyers are usually the last to show up before prices roll over so be careful. While it feels like the market wants to challenge 1,900, this is the later stages of this rally leg and we should be taking profits, not establishing new positions. While we are in a decade long secular bull market and buy and hold investors can sit tight, expect intermediate dips along the way. Shorter timeframe traders should continue buying weakness and selling strength. Stocks recovered a portion of last week’s losses in one of the lowest volume sessions of the year. We reclaimed 1,850 support and remain above the 50dma. The market didn’t bounce Monday because dip buyers flooded the market, but because existing owners were uninterested in selling and the resulting tight supply supported prices. While nothing improved over the weekend, things didn’t get worse either. Sometimes no new bad news is enough to calm nerves. Given the low volume rebound, this only reassured owners and kept them from selling while most prospective buyers continue waiting for more clarity before rushing in to buy. Even though tight supply can slow the slide, we need conviction from buyers to push us back to new highs. So far buyers are not feeling it and we need to be suspicious of this rebound. Sometimes the market blows risks out of proportion, others it under appreciates the dangers. Given the market is 1.3% from record highs, the market is many things, but panicked over current events is not one of them. While this situation could play out exactly as the market predicts, we are vulnerable to a selloff if anything unexpected comes up. We only get paid to own risk when we buy at a discount and it is hard to justify owning here for a measly 1.3% discount. Selloff or not, if people are talking about something, it is priced in. While we are barely off the highs despite this geopolitical risks, we could be significantly higher without them. Once the market moves past this headline cycle, it could easily pop as we catch up to where we should have been. We don’t need to selloff in order for there to be attractive values. While the situation will most likely resolve itself as the market expects, we are not getting paid to own the risks near all-time highs. We could go higher from here, but the risk/reward is not in our favor and doesn’t setup a favorable trade. 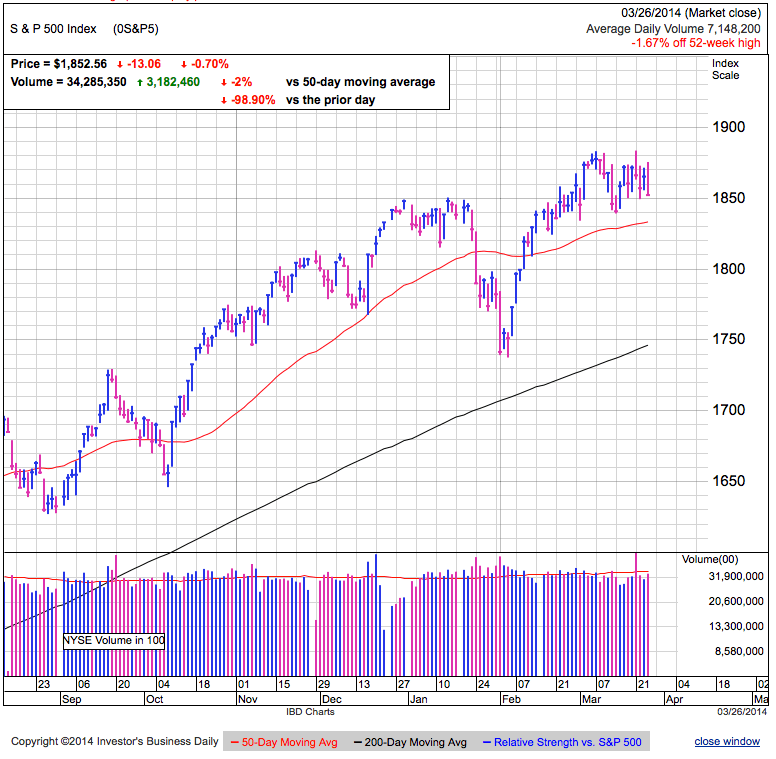 Stocks opened higher, but plummeted into the red, crashing through prior support at 1,850. Volume was barely above average, suggesting the selling was not nearly as dramatic as the price-action made it appear. We closed a few points under 1,850 and triggered a wave of automatic stop-loss selling under this support level, but this where the selling stalled, not accelerated. Flushing out any and all with an itchy trigger finger makes it easier for the market to find a floor on Friday. Last week we rallied in the face of weak Chinese data and political confrontation in Ukraine, but this week we sold off on the same headlines. Rather than attribute this strength and weakness to headlines, it appears to simply be typical market gyrations. Modestly above average volume on such a “shockingly large” decline suggest this weakness was more due to a lack of demand than heard based selling. We’ve come a long way on all timescales and after running out of momentum chasers and short-covering, a wider pool of prospective buyers seems uninterested in paying record highs for stocks. While weak demand is weighing on stocks here, we need to see previously confident owners change their minds and sell if this weakness is to accelerate lower. Through multiple dips, most owners showed they are comfortable holding headline risk and seem unphased by weakness here and there. That confidence in the future keeps supply off the market and make it easier to find a bottom. This rally will end like every one before it, but first we need a catalyst to shatter owners’ confidence. So far that still seems missing. Expected Outcome: Stalling near upper end of trading range. Vulnerable to a larger selloff, but need a catalyst. Markets slipped today, but this 1% dip is unlikely to concern many owners who have confidently sat through bigger selloffs in recent months. As long as they keep holding, it will be hard to enter a downward spiral of selling. For that we need something to interject a large amount of uncertainty into the market. While Ukraine could be that catalyst, the market’s ambivalence last week shows most traders are not buying Obama’s and Putin’s bluffs. While the market is vulnerable to a bigger selloff, look for it to find a floor soon unless headlines take a significant turn for the worse. Sometimes markets fall for no other reason than herd driven selling. If the market crashes through the 50dma, expect many traders to adopt a sell first, ask questions later approach to risk management. If the selloff stalls on Friday, we could be in the mist of another buyable dip. For the short thesis to work, we need far more scary headlines to shatter the market’s confidence. Stocks slipped in early trade, but bounced off 1,855 by midday. 1,850 was resistance over the first couple months of the year and appears to be providing support here. Currently we find ourselves in the middle of the trading channel that dates back to November 2012. There are few explanations to justify the last couple days of weakness and many in the media are chalking it up to “profit-taking”. Volume has been below average, showing this dip is more a product of weak demand than active selling. Owners are comfortable and confident. While many contrarians say that is a sign of bad things to come, in the near-term, that confidence keeps supply tight as few owners are willing to sell. For the market to rollover, we either need a fearful headline to shatter this complacency, or to run out of buyers willing to pay top-dollar for stocks. The run since the November 2008 lows is nearly 17-months old. It is not unusual to see gains taper off as the market prices in future expectations and then waits for the confirming fundamentals to catch up. 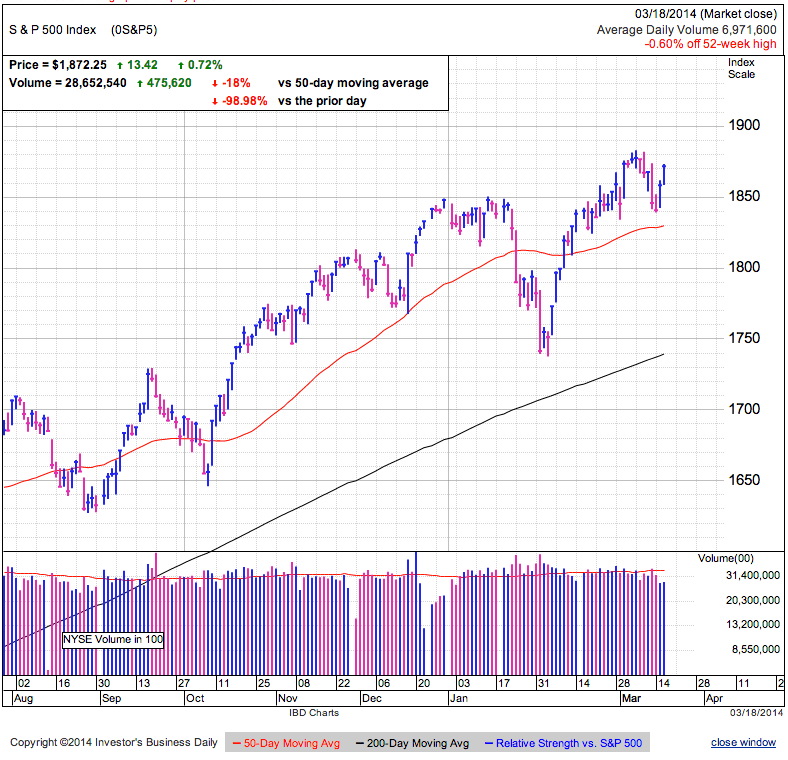 The market needs to consolidate recent gains and will likely trade sideways until the 3rd Quarter. That doesn’t mean we cannot hit 1,900 in the near-term, but it suggests the upside potential is far more limited than the downside risk. Momentum is clearly higher and history has examples of rally legs lasting multiple years. As long as there is new money ready to chase this market higher, there is nothing that will stop it. Long-term investors can continue sitting on their investments, but they should hold off on adding to their favorite positions since we will likely see better prices in coming months. Short-term traders should take profits proactively or use trailing stops to protect recent gains. With so little fear priced into the market, there are few headlines that could trigger a surge higher, but one bad headline could send us tumbling. That doesn’t set up a favorable risk/reward. AAPL is retook the 50dma after struggling with this level since 4th quarter earnings. It is widely expected the iPhone6 will have a larger screen to stem the market share losses to Android competitors, so that is unlikely to be an upside catalyst for the stock. We haven’t had anything new and exciting out of AAPL since Steve Jobs resigned as CEO and is why the stock is well off the highs. Can Tim Cook pull something out of the hat this year? AAPL bulls are certainly hoping so. TSLA is bouncing today following recent weakness, but it wouldn’t be surprising to see the stock close the gap and allow the 50dma to catch up before resuming the up-trend. 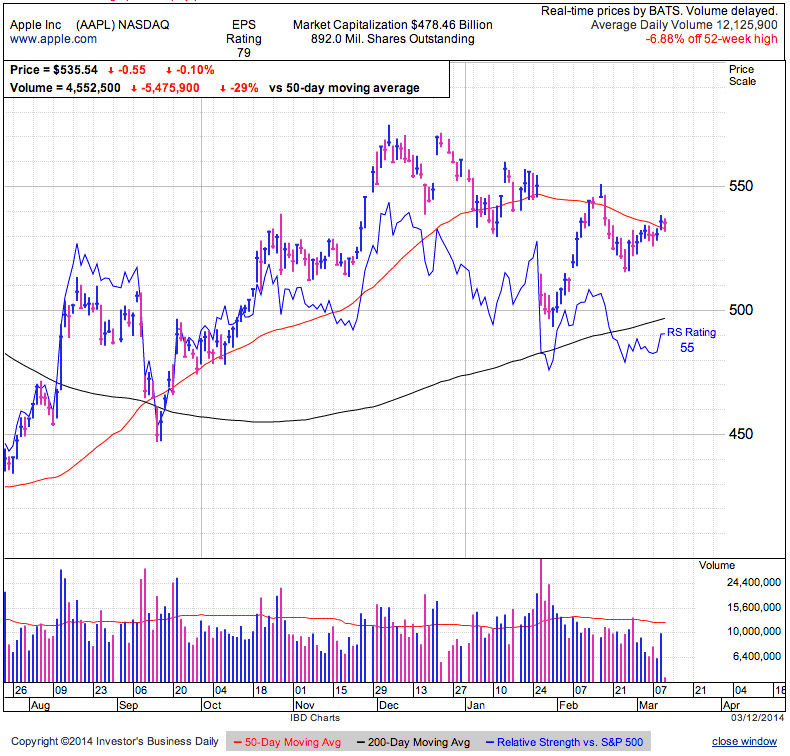 P is reclaiming the 50dma on above average volume, signaling a potential buy-point. Since so few traders love this stock, it means there is upside if it continues to defy the skeptics as it successfully fights off competition from AAPL and others. Stocks gave up early gains and finished in the red for the second consecutive day. We broke under recent support at 1,870, but the “free-fall” only pushed us down a few more points before bouncing off 1,865. Volume was higher than yesterday, but still below average. Without any real headlines to attribute today’s weakness, the media blamed “profit-taking”. Despite breaking recent support, we didn’t see sellers flood the market as volume remained constrained, meaning today’s weakness was more due to a lack of buying than wave of selling. Most owners remain confident and are waiting for higher prices. Every time they sold weakness in the last couple years was a mistake and traders have become conditioned to hold weakness and buy dips. While it’s worked to this point, we need to be more careful the less fearful traders become. Momentum remains higher and so far today’s weakness doesn’t look like anything more than the normal ebb and flow of supply and demand. Down days are a normal part of going higher and without fearful headlines, expect any weakness to be short-lived as owners confidently hold through modest dips. Markets often move as a herd. Typically it takes something to spook the herd into a stampede, but sometimes selling begetting selling is all that is needed. Journalists always invent reasons after the fact, but sometimes people sell for no other reason than other people are selling. Some weakness here helps keep the market fresh, but the downside risk of owning sill out weights the upside reward of a grind higher. Long-term owners can continue holding, but intermediate traders should consider locking in recent gains. Stocks recovered to flat after slipping modestly in early trade as they continue finding support at 1,870 for the fourth consecutive day. The market remains near all-time highs because owners and buyers keep believing in these levels. We’ve seen multiple headlines that could have sent us tumbling if this rally was fragile and over-extended. Instead it ignored this “noise” and suggests we are standing on firm ground. Today’s trade was on light volume, showing this strength was due more to reluctance by owners to sell than buyer’s enthusiasm to buy. Since price is derived from both supply and demand, as long as owners remain confident and reluctant to sell, the resulting tight supply supports prices. Markets often oscillate around the “right” price. Sometimes they are too high, and others too low. Since there is virtually no fear in the markets, that suggests it is more likely we are too high, rather than too low. This makes it a riskier time to own stocks since the upside is more limited than the downside. Momentum is clearly higher, but the risk/reward of owning here not great. The best profit opportunities come from buying fear and selling confidence. The recent dip to 1,740 cleared many weak holders and left us with a confident ownership more willing to hold risk and volatility. When no one is interested in selling headlines or weakness, markets march higher. Stocks are the most risky to own when it feels the safest. Be careful with long positions here as the potential upside is dwarfed by the risk below. Long-term owners can continue holding, but they should wait for better prices before adding to positions. Short-term traders should lighten up and bears can jump on violations of support. Stocks are trading in a tight range following Tuesday’s rebound to new highs. Traders are indifferent to threats of economic sanctions against the largest oil producer in the world. Pretty crazy how inflation in Turkey sends us tumbling 100-points while hostile words between the US and Russia propels us to all-time highs. If the market made everyone would be rich. It appears the market is calling Putin’s and Obama’s bluff, assuming neither one has the courage to escalate the situation any further. But if the market expect business as usual, that means there is little upside if this situation is resolved, yet it exposes us to huge downside if it deteriorates. Little upside and lots of downside, not exactly the best place to own stocks. Over the last year the market was afraid of its shadow, but as every predicted disaster turned into a buyable dip, traders are growing more apathetic toward risk. One of these days we will come across a situation that is worse than feared and that will be the catalyst for the next correction. While reality is often not as bad as the market fears, that only occurs after it sold off and more than adequately priced in the risk. Here we have the opposite, real risk and uncertainty, yet we are making new highs. Making money in the markets comes from understanding the risk/reward. We need to know when to buy risk and when to sell it. Owners are stubbornly holding on to stock and even conflict among the world’s superpowers is unable to shake their resolve. While this could end badly, prices won’t go down as long as confident owners keep supply scarce. It doesn’t matter what the market should do, only what it does. For the short-term trader, there is little reason to own stocks here. We are at the upper end of the recent trading range and the market is indifferent toward geopolitical risks. While momentum can continue pushing us higher, the potential gains are dwarfed by the downside risk. Buy weakness and sell strength.